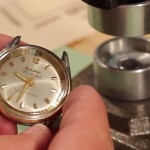 When it comes time to put your watch back together after removing a damaged or broken gasket fit watch crystal, you will find that a watch crystal press is an indispensable aide. 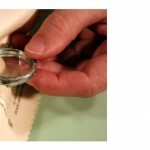 Learn how to use a crystal press to fit a domed gasket fit crystal with this guide. Once you have removed the inner workings of the watch, and you have your new domed watch crystal in hand you will need to choose the watch press dies that fit the watch case appropriately to insert the crystal. Next, you will need to find the die that will fit the new domed watch crystal. You want to find the die with the straight inner walls that rest just on the outer edges of the loose crystal without touching the dome, like this. Holding the watch crystal in one hand, start fitting watch dies to it until you find the one that covers the crystal with the straight inner walls positioned to apply pressure just to the outside edges of crystal. Take your selvyt cloth and place it across the lower die to protect the back of the watch case from being scratched by the die. 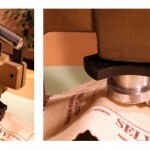 Place the watch case on the cloth covered lower die in the jaws of the watch case press with the top of the case facing up. Then, take your loose domed crystal and position it over the opening in the top of the watch case so the pressure will push the crystal in the watch bezel to give it a good seal.